In our recent trip to Mérida when we stopped at the Mexico City airport I immediately went to a bookstore to see what I could find. I was rewarded in finding a very new just released (2018) novel La Transparencia del Tiempo by my fave contemporary Cuban writer Leonardo Padura (formerly going by the name of Leonardo Padura Fuentes). This novel is unique in that it is all about a very today Havana in which our ex-cop, bookseller and finder, Mario Conde is about to become 60. 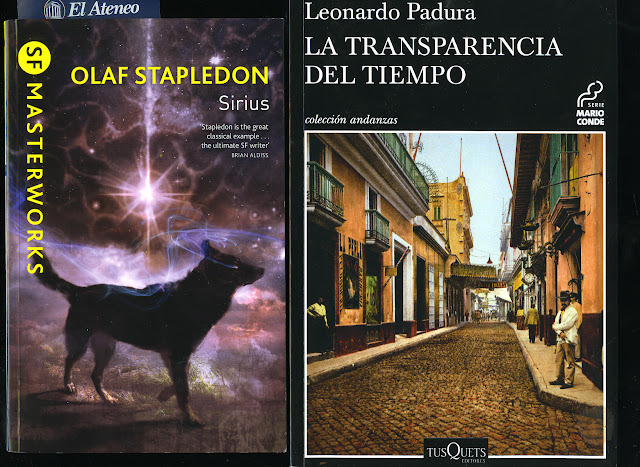 Padura’s protagonist suffers a bit of existential ennui in a city in which Padura carefully skirts what it is like to live in the regime of the moment. But the novel is unique in another way. I would not have been able to read this book comfortably in pre-smart phone times. When I read Jorge Luís Borges, Mario Vargas Llosa, Homero Aridjis or Julio Cortázar I do not have to constantly consult a mataburros. The donkey killer is Castillian Spanish slang for a dictionary. Durante demasiados años, muchas veces, habían comido gracias a las artes ocultas de Josefina [una eximia cocinera de 80 años], pero nunca habían lapidado la ansiedad nutritiva endémica sufrida a lo largo y ancho de sus vidas, como millones de cubanos, cuyos estómagos habían sido custodiados durante décadas por la libreta de abastecimiento, ¿o de desabastecimiento?, que les impedia morir de hambre y no les permitía vivir sin hambre. Y por eso, cumplido el momento estético, se lanzaron al ataque. For too many years, often they had eaten thanks to culinary magic of Josefina [a very good cook at 80], but they had never eliminated that endemic nutritional anxiety of their whole lives, like many Cubans, whose stomachs had been taken care of by a ration card , or an un-ration card?, which prevented them from dying of hunger and did not prevent them from living without hunger. That is why now faced with a table of food they went on the attack. Padura’s way with words goes further into the realm of words I have never ever seen before. Every time I have read a novel in English with the word inchoate I guess at its meaning. To this day I must look it up. With Padura when reading in bed my smart phone is on the night table ready for the word search. Al llegar a su casa y antes de regalarse una siesta que lo aliviara de la cañicula nasesina del mediodía, Conde había llamado a su amigo Carlos. When he got home and before gifting himself with a siesta that would aleviate “the canicula “of the midday, Conde had called his friend Carlos. I had never seen this word, canícula before. I looked it up and it was all about early summer heat. But I became curious with that route word cani. La canícula, período canicular o días de las canículas es la temporada del año en la cual el calor es más fuerte, tanto en el hemisferio Sur como en el Norte (desfasados seis meses entre sí). La duración oscila entre cuatro y siete semanas, dependiendo del lugar. La canícula comienza unas semanas después del solsticio de verano (que ocurre el 21 de junio en el hemisferio norte y el 21 de diciembre en el hemisferio sur); es la época en la que el sol del mediodía está a la máxima altura posible sobre el horizonte. Una fecha aproximada es el 14 de julio para el hemisferio norte. Su primera salida, es decir su reaparición como estrella visible en el cielo de la mañana después de su período de invisibilidad, coincidía hace algunos siglos con los días más calurosos. De ahí proviene el calificativo de días perros. La procedencia de la denominación Sirio no está del todo clara. Tal vez el nombre procede de la astronomía de la antigua Babilonia y (...) la misma palabra significa también la abrasadora. Por otra parte, la gente de campo, sobre todo las personas mayores que se acostumbraron a iniciar la siembra de sus cultivos mirando a las estrellas en los países de América Central, notaban que cerca del 15 de julio el clima se secaba y no era conveniente sembrar. Este tiempo seco terminaba cerca del 15 de agosto, en cuya fecha reiniciaban la siembra. Este tiempo parecía coincidir con la posición de la constelación del Can Menor en el cenit a la media noche, aproximadamente de los 15 grados a los -15 grados del cenit. A este tiempo se le denominaba canícula (can pequeño), por referirse al Can Menor. The dog days or dog days of summer are the hot, sultry days of summer. They were historically the period following the heliacal rising of the star Sirius, which Greek and Roman astrology connected with heat, drought, sudden thunderstorms, lethargy, fever, mad dogs, and bad luck. They are now taken to be the hottest, most uncomfortable part of summer in the Northern Hemisphere. The English name is a calque of the Latin dies caniculares (lit. "the puppy days"), itself a calque of the Greek kynádes hēmérai (κυνάδες ἡμέραι, "dog days") The Greeks knew the star α Canis Majoris by several names, including Sirius (Σείριος, Seírios, "Scorcher"), Sothis (Σῶθις, Sôthis, a transcription of Egyptian Spdt), and the Dog Star (Κῠ́ων, Kúōn).The last name reflects the way Sirius follows the constellation Orion into the night sky. To anybody who remembers the film the 1975 Dog Day Afternoon with Al Pacino you know it is about sticky heat. So Conde is complaining of a very hot tropical noon which he is going to alleviate with a siesta. Further research informed me that the brightest star in the night sky after our sun is Sirius which takes me to that lovely science fiction book Sirius by Olaf Stapledon a writer whom I have read and admired for years. As for Padura’s novel my Galaxy is on the ready for further consultation.